Wouldn't it be nice if you could see the win percentages of specific deck variants when you compare them? With your help we can achieve that! If you are a Track-o-Bot user, you can help us by sharing your game data. We will then analyse this data anonymously so that we can associate every deck in our library with a specific win rate. That way the information HMD provides will be even more helpful. Track-o-Bot is a fantastic little app that runs in the background, tracks your games, and makes them available to you in a web interface. It works on Windows and Mac, does not interfere with HDT and is generally well made. Find it at trackobot.com. Helping us is easy! All we need is your Track-o-Bot credentials. If you're curious what features we're working on, don't hesitate to write us! We're always happy about feedback. Your Track-o-bot data contains no personal information about you or your Blizzard account. Even the card history does not record your Blizzard gamertag nor that of your opponent, but instead only lists you and your opponent as 'me' and 'opponent'. We will treat your TB username and your token with utmost care, and will never give a third party access to the data. You can revoke our access at any time, by regenerating your token on the Track-o-Bot website. Where do you find your token? 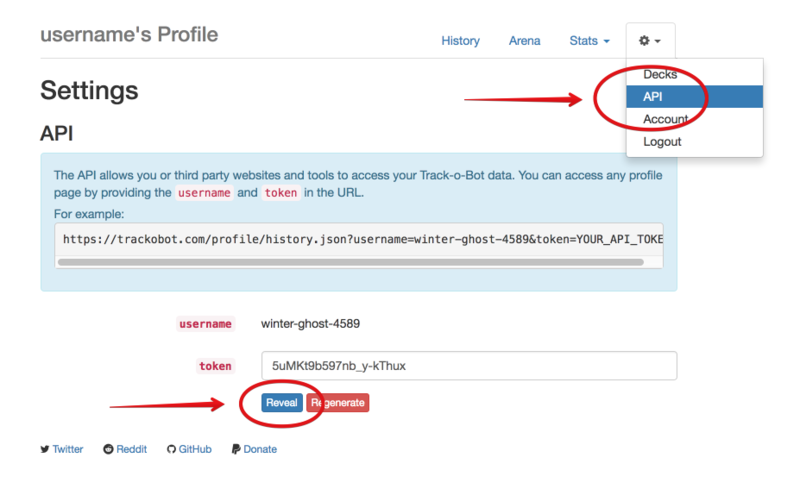 If you are using Track-o-Bot and you're logged in, you can find your own profile here.